Issue 166 (January 2013) - Survive the zombie apocalypse! OK, we`re being a little bit daft about the zombies, but they`re a useful metaphor for all the things that can go wrong with data stored on a Linux box. Partitions go missing, files get deleted by accident, and zombies pull out the plug of your PC just as you`re saving something to disk. It`s bad juju, but with our guide to surviving data disaster you`ll be prepared. Also in the magazine we round up the best new desktop environments, because we`re getting sick of Unity and Gnome 3, we talk to selection of Linux wise men to find out what they think the big issues in free software are, and we also make browsing the web a safer experience with our look at parental controls for Linux. On the tutorial front we build a custom distro for a Raspberry Pi the hard way, learn recursion with Scheme and get coding with the Geany IDE, among others. 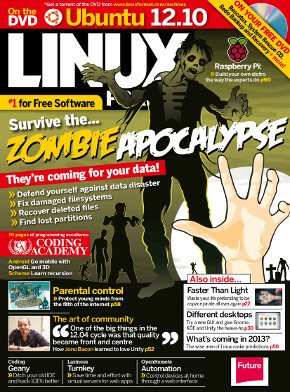 On the disc: we have four versions of Ubuntu Quantal Quetzal, and the LXF disaster survival kit. We hope you like it!